In Mel Brooks' famous comedy, "Blazing Saddles," a preacher delivers the line, "Oh Lord, do we have the strength to carry out this task ... or are we just jerking off?" It is a question that will always be appropriate to ask of the work and purpose of the Iraq Survey Group. Your point of view depends on where you stand. However, revisiting the CIA report on Iraq's lack of WMDs always turns up something new. For example, in an addendum released by the ISG in March, one reads of "Usama the Computer Hacker." "Usama," informs the report, "was the nephew of Saddam's second wife ... and was an accomplished computer hacker." Like many computer hackers, Usama was adept at exaggerating his cyber powers in a successful effort to con a building full of computing equipment out of Iraq's intelligence apparatus. Once installed as Iraq's allegedly ace hacker, Usama's theoretical job was to intercept and disrupt US military communications and warn of impending attack. "Usama failed to provide warning of the Coalition attack..." states the ISG text. According to an informant, Usama subsequently vanished leaving all his equipment behind, unused. Returning to the main body of the ISG's assessment, an assessment which already has been discussed by many at great length, one finds on page 45 of the section entitled "Iraq's Chemical Warfare Program -- Annex A," photos of a couple of interesting things: a picture of empty plastic perfume bottles and a bottler -- said to be contemplated for use in squirting mustard gas into the faces of Americans -- and a cardboard box with a bottle of a chemical investigated for its potential in assassinations. While the ISG recovered no smoking gun of squirtable mustard gas, the chemical in the cardboard box was sodium fluoroacetate, also called Compound 1080. Compound 1080 is converted into an analog which poisons a critical enzyme in the final common biochemical pathway of oxidation of food and nutrient molecules in aerobic organisms, for this case, warm-blooded animals. This reaction's consequence is great toxicity. Compound 1080's use is very strictly controlled in the United States where government agency occasionally OK's it for the killing of coyotes. Because of the compound's well-documented hazard to animal life, even the dispensation of it in these cases is often subject to citizen protest. So it is rightly seen as problematic that minions within the Hussein regime had interest in sodium fluoroacetate. It is not a thing that should be in the hands of tyrants, intelligence agencies, militaries, secret police or terrorists. The Iraq Survey Group report says Iraqi intelligence services "researched a variety of chemicals including: Fluoro-acetate, nitrosoamine, strychnine, [and] thallium chloride ..."
The ISG's photo of a bottle of sodium fluoroacetate found in Iraq was taken in early May 2003. The bottle is labeled in English, as it should be, because fluoroacetate is manufactured by the Tull Chemical Company, of Oxford, Alabama. It is the only legal maker of sodium fluoroacetate in the United States. Since the bottle of Compound 1080 recovered by the Iraq Survey Group has, potentially, such a clear provenance, it is surprising that there was no more comment on it in the report. It literally begged the inspector to contact its American vendor for information on the lot information, date of sale and final destination. 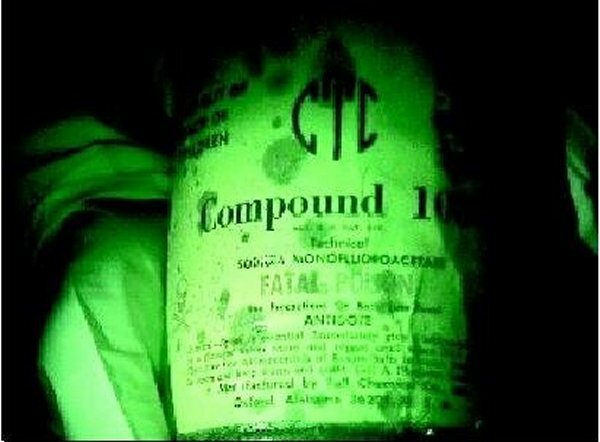 Was Compound 1080 bought directly by the Hussein regime or did it arrive through black market channels? If the former, how much Compound 1080 was purchased and what reason was given, if any, as to the need for it? Questions, questions, always more questions. Within the overall context of the Iraq Survey Group report, the lack of information on the bottle of Compound 1080 is unusual because so much else in the total effort is meticulously detailed, extending to long tracts of analysis which are largely a collection of first person accounts and hearsays contributed by witnesses or prisoners of unknown credibility and condition. Of course, a highly regulated American-manufactured super poison in the hands of bad people is potentially awkward news, even if minor. But it is a little late in the game to be squeamish about such things now. On April 14, the Guardian newspaper in Britain published a commentary by Duncan Campbell entitled "The ricin ring that never was." Campbell, an expert for the defense in the case of Kamel Bourgass et al, wrote critically, but utterly without malice and from a generous intellectual spirit, on the results of the trial and its implications. "I was asked to look for the original source [of Bourgass's poison recipes] on the internet," wrote Campbell. "This meant exploring Islamist websites that publish Bin Laden and his sympathisers, and plumbing the most prolific source of information on how to do harm: the writings of the American survivalist right and the gun lobby." This eventually led to the conclusion, destructive to the government case, that the Bourgass notes could not be tied to al Qaida documents recovered in Afghanistan or a book taken off an old Afghan jihadi in England. Campbell named two Porton Down scientists who had presented evidence in the trial and commented upon the meaning of it. On the 15th of April, Campbell and the Guardian were sent a letter from the British Ministry of Defense's Director General Legal Services, Martin Hemming. Hemming writes, "I understand ... [that at the trial] you would have seen the witness statements of Porton Down witnesses, and learned a number of their identities, functions and experience. "You should be aware that a public interest immunity certificate was submitted to the Court on behalf of the Secretary of State for Defence, requesting an order to protect the identities of a number of the witnesses. In the usual way the certificate was supplied to the defence lawyers ... The majority of the application was heard in open court, and during the course of it the defence expressly conceded that the application was justified in order to protect the safety of the witnesses from persons unconnected with the case. Thus the trial Judge granted that application that there should be no reference to their identities. Consequently, a number of Porton Down witnesses ... were identified only by cipher and were screened from the public when they gave their evidence." "Whilst on 13 April a number of orders previously made under s.4 of the Contempt of Court Act 1981 were lifted, the order made in the public interest in respect of the anonymity of the Porton Down witnesses remains in force." "Apart from your article, there has been no public identification of any of the protected individuals who gave evidence in the trial," wrote Hemming. Hemming bid that no further such disclosures be made. There was no notification within the memorandum that it be kept confidential. The Guardian subsequently withdrew the original of "The ricin ring that never was" from its website. However, the withdrawal had the inverse effect of covering "public identification" of the Porton Down scientists. The column multiplied around the web accompanied by stories in the British alternative news media claiming suppression. In addition, the April 11 and 13 issues of National Security Notes in the United States had cited the work of Porton Down scientists. While terms like "D-notice" and "government censorship" of a commentary that went against the grain were bandied around, it is not obvious from the memorandum that this is at all what the UK government had in mind when the letter was sent. People may have simply thought they were doing the right thing in registering a complaint and a reminder that legal constraints on certain aspects of reporting remained in place. A cigar could just have been a cigar. It is not unreasonable to make this assumption. But the MoD was also mistaken, perhaps understandably, when the judgment was made on April 15 that formal news agencies in the United Kingdom other than the Guardian had made "no public identification of any protected ... individuals who gave evidence." On April 13th, the BBC's Jon Silverman, in a sidebar news article on the Bourgass trial entitled "Comment: Questions Unanswered," publicly identified one of the Porton Down scientists at the trial. And on April 17, Liam McDougall of the Sunday Herald named two Porton Down scientists. The nature of their appearance in the Herald's report strongly suggests the newspaper cut-and-pasted information verbatim from reports in National Security Notes on April 11 and April 13. The BBC and Sunday Herald articles remain on the world wide web over a month after the finish of the trial. It is fair to argue, then, that it is in the public interest that names be attached to declarations and actions of leaders, professionals and experts in the war on terror. History calls for it and recent events show beyond doubt that the opinions and assessments of those in charge of prosecuting the war on terror can turn disastrously wrong. For instance, in the case of Bourgass et al, it is important to know an individual at Porton Down took the news of -no ricin- in Wood Green and turned it upside down. British authorities transmitted this bit of wrong-headedness to the world where it was repeated at length and used to support Colin Powell's slide show for the UN Security Council presuming to show the London Algerians in a cooperative venture with an al Qaida terrorist operating from Iraq. In summation before handing the case to the jury, the judge, Mr. Justice Penry-Davey, devoted a great deal of time taking the jury through the Porton Down worker's mistake. The jury was informed in no uncertain way of the fumbling and clumsiness that led to the error. It is an important point because while there was a great deal of effort expended by the British government and news media in the trumpeting of misinformation that ricin had been found at Wood Green, there was no balancing effort undertaken by the UK government or Porton Down commensurate with the original publicity to correct the misunderstanding once it had been made and sent everywhere. "[The Porton Down man] admitted in court that he had not passed on the test results and that the public had been misled as a result," reported the Times. The BBC's "Questions unanswered." Enterprising readers may wish to preserve this comment in some manner, should it prove ephemeral. "A pestle and mortar and castor beans ..." in the Sunday Herald. "Trial had made return 'unsafe,'" from the London Sunday Times. Multiplication of "The ricin ring that never was:"
"Bioterrorism: Early Detection and Response" (through the Infectious Disease Research Network, London) -- a research strategy workshop including seminars of many now publicly identified Porton Down scientists, among others. Ironically, this document is marked -confidential- although it appears to have been circulating since late 2003. Suspenseful video of Kalonji black onion seeds? The London Metropolitan police produced a video of the raid on the apartment in Wood Green, entitled Operation Springbourne. In text accompanying the video, various claims are made, claims at loggerheads with the results from the trial of Kamel Bourgass et al. "During a search of premises in Wood Green, London on 5th January 2003 detectives discovered residue from a homemade poison," declares the police article. No homemade ricin was discovered at Wood Green. Castor seeds were discovered but unfortunately are not seen in the video. "We must also remember that this case was about a conspiracy between a small group of terrorists," claims the report. The jury did not find a "small group of terrorists." The video shows an anti-terrorism police officer handling a paper of cherry pits and "a wrap of black seeds." The Porton Down scientist accompanying and advising the police wrote in his report that it was his opinion a "black powder" on a paper at Wood Green was an amount of "black onion seeds," the same as a "[glass] jar marked Bart spices kalonji black onion," gathered from the apartment and entered as evidence. On April 13, the New York Times covered the Bourgass trial. The Times has had a documented rough time of it reporting on the intersection between alleged exotic al Qaida weapons and the war in Iraq/war on terror. Its article on the alleged poison ring in London did not depart from tradition. Reporter Alan Cowell furnished a piece that was largely a mixture of UK anti-terror forces jive and frankly weird mistakes brooking no intrusion of reality. In the story's fourth paragraph, Cowell writes, "Details of the trial emerged only today after a judge lifted strict reporting restrictions on two secret jury trials of Mr. Bourgass, arrested in the aftermath of the reported discovery of traces of ricin in an apartment in north London in January 2003." In the very next sentence, Cowell writes: During [Bourgass's] arrest, in Manchester in the north of England nine days after the ricin was found ..."
Near the end of the story, it is said, "They were said to have used household ingredients like tobacco, cherry stones and castor oil to make poisons." Ricin does not come from castor oil and "poisons," those discussed in the Bourgass trial, cannot be made from it. Attention, New York Times! Castor seeds were recovered, castor seeds! As has been reported many times, no canonical biological or chemical weapons were found at Wood Green by a Porton Down scientist. A video, released by metropolitan police and cited previously in this issue, shows a paper laden with some cherry pits. Followers of the trial know that what was reported was a false positive, that a UK government scientist had determined this to be so and that another Porton Down employee was responsible for passing on incorrect test results with significant consequences for the story. The New York Times article on April 13 reported none of it. The New York Times was, however, informed of these matters twice prior to the finish of the Bourgass case. In late 2004, National Security Notes informed a well-known Times reporter who covers biological weapons and terrorism for the newspaper that no ricin had been found and that Colin Powell, once again, had been in error when he linked the London group to an al Qaida operative in Iraq. The reporter expressed interest and the matter was again discussed in 2005, still prior to the conclusion of the case. However, the Times declined to pursue the story. No ricin from the ricin ring was newsworthy and neither was Colin Powell uncovered in another mistake of so many in the war with Iraq. Fair enough. The New York Times is a large institution, it is free to pursue the news in any way it sees fit, and it's reasonable to assume that reporters and editors don't always share information.